How is it that the sight of a familiar object can send me tumbling backwards? I thought I was making such progress here. Back in the winter of 2006, when I was pregnant with E, M’s parents came to look after our girls, and M and I flew to Paris. We each happened to have some work we could do there to justify the week-long trip. A visit to the Shostakovich archive for M, a presentation to urban planners at the Sorbonne for me. M’s brother joined us for part of the trip, and he was the one who introduced us to the Petit Palais. It’s one of the landmarks in Paris, but there are so many that we easily could have overlooked it, had he not encouraged us to go for a quick visit. The palace was of course stunning, and its most distinguishing detail was the curved iron grillwork on the stairwells that climbed from the ground floor to the first. After our tour we wandered into the gift shop. 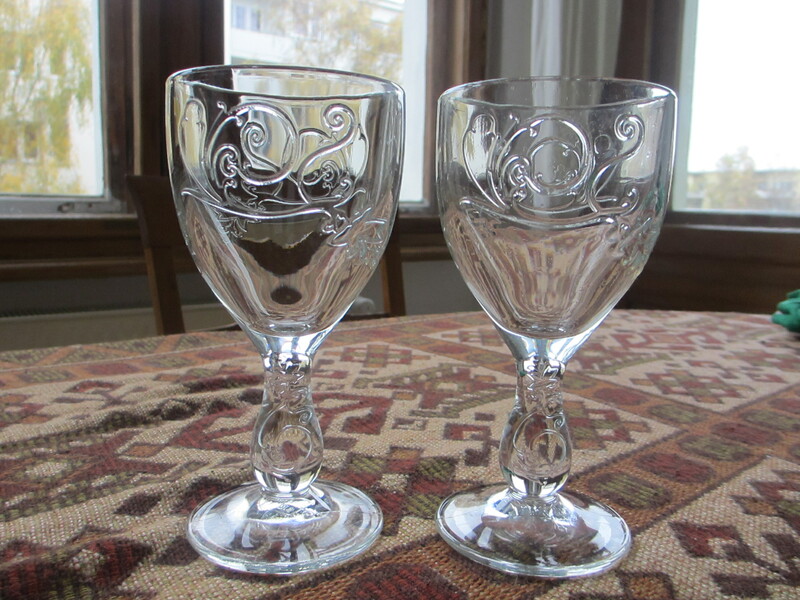 We saw many lovely things, but what caught our eye were sturdy wine glasses featuring the pattern of the iron grillwork for a mere 4 euros apiece. We bought four glasses and were almost giddy. They were, and remain, our favorite souvenir from that trip. In St. Paul we use them almost daily. We call them our Paris glasses, and we are more likely to reach for them than any other glasses we’ve accumulated over the years. Though they are not delicate and their pattern clearly shows the edge of the mold where they were pressed, we overlook their flaws for what they mean to us—fun times spent together years ago, sturdy enough for at least two of the four to have survived the intervening years. Yes, two bit the dust in some minor household incidents, one dropped on the porch, the other cracked in the sink. But still, they’ve held up better than the rest of our thin stemware that requires constant replacing. We did not bring the Paris glasses to Berlin. Our flat is stocked with dishes, and there’s a set of eight small, thin wine glasses that function just fine. They are nothing to get sentimental about, just something to hold your drink. On one of our early days in Schöneberg, M returned from a walk and shared this bit of news: he’d been in a local kitchen store and had seen the very same Paris glasses we have at home. Right here in our neighborhood, for under 6 euros. “Did you buy any?” I asked, though I could tell he hadn’t. But those sorts of things don’t happen twice, do they? M did return to the palace with the girls when we went to Paris in October, but they no longer sold the glasses we associate with the place. “Yes, but… I don’t remember where it is anymore,” said M, much to my dismay. Fast forward a few weeks. I’m wandering through our neighborhood, deliberately adding a block to my short errands just to see how the streets fit together and expand my familiarity with our little area. On Goltzstrasse I found the Apfelstudio I’d heard about, an open air storefront where only apples are sold, fresh picked in the country and offered to city folks, and as I left there with two bags of apples I saw the sweetest kitchen storefront imaginable across the street. I hurried over and went inside. Whoever worked there must have been in the stock room, so I felt free to admire all the gadgets and cutlery and glassware and baking dishes that glittered in the morning sun. Here were all the things missing from our kitchen! Paring knives, mixing bowls, pie plates, muffin tins. And in the window display, the very display that first caught my eye, were four Paris glasses, the same ones we have at home. I had found the missing kitchen store! And the Paris glasses were still here! Excited, I picked up the two closest to me and marched them to the register, where an attractive older woman had appeared. As I set them down I saw a chip on one of them, and blurted out, “Oh, this one has a crack!” in English. “Then take it back and get another,” came the woman’s voice in perfect English, with an edge of annoyance in her tone. I hurried back to swap out the glass, chastened by her voice, berating myself for being the ugly American who assumes everyone will speak English to her. It just came out. As I returned to the desk I resolved to make up for it. In German I tried, “Es tut mir leid. Mein Deutsch ist sehr schlecht, aber ich bin soo fruhlich diese glasses finden!” I gave her a big smile. I wanted so much to convey how happy her store made me, that the sight of these glasses cheered me immensely, and seeing them here on her counter, ready to be wrapped in paper to come home with me so I could surprise M with my find, was almost overwhelming. But I had misread the woman. She was not the friendly checkout lady from the Bibelot on Grand Avenue in St. Paul. Caught up in my desire to connect with someone, anyone, even this grumpy woman in this most beautiful store, I wanted to break through to her. “Wir haben diese glasses im USA… wir kauffen dem im Paris…” I stumbled, lacking the vocabulary to go on. “I do speak English…” she reminded me. “Oh, right. Well, we bought four of these in Paris, but two have broken, and they’re our favorite glasses! I can’t believe you have them. I’m so excited to take them home…” I trailed off, detecting a look of disdain in her eyes, realizing that these glasses, such a reminder of home, the real one, were going to make all else in our barren flat pale in comparison, and that I was dangerously close to crying in front of this woman who really could not care less about my emotional connection to these cheap, clunky glasses. “Eleven ninety, please,” she said, and I dug in my purse for the change, furious at myself for getting so close to the edge in front of someone who was not interested in my story. I handed her the money and left with a simple Danke and a Tchuss, and stepped out onto the sidewalk in a mixture of relief, elation, frustration, and annoyance at my inability to say what I meant and understand the people here and know how a simple transaction is supposed to unfold. She had led me on, this shopkeeper; the window filled with homey things artfully displayed convinced me that whoever worked here would be a softie, someone who would care very much that her customer is delighted to discover her store, and happy to find a simple thing like two glasses from the Petit Palais. But she had made no effort to share my excitement. I took my packages home. M was reading at the kitchen table. I proudly handed him the glasses wrapped in paper, and then I sort of fell apart. Somehow the sight of these wine glasses that are so evocative to us alone, seeing them here in this austere apartment, the memory of being pregnant with our last child, the closeness we felt all those years ago in Paris, the indignity of my shallow German, the woman who didn’t care, all hit me at once. I tried to contain this outburst but couldn’t. M has taken past displays of tears as an indication of me saying I don’t want to be here, that this whole sabbatical was a mistake. “I’m glad we’re here,” I said, “I’m crying because I’m happy,” but we both knew that wasn’t quite it. Whether he believed me or not, he withheld comment and forgave me with a hug. Now when I open the cupboard doors and see the Paris glasses I am pleased. Whether they are in the dish strainer waiting to be put away or full of Entre Deux Mers on the kitchen table, they are solid and lovely and functional. They should survive this sabbatical, like their owners themselves. This entry was posted in Sabbatical and tagged apfelstudio, Berlin, Entre Deux Mers, Paris, Schöneberg, Shoktakovich archive, Sorbonne, wineglasses on November 12, 2013 by Jill M..
They’re lovely! I can see why they’re so evocative for you. Interesting how different objects bring back memories of wonderful times. For me, it’s a small blue glass dolphin bought on a beach trip I took with friends. Right, a “souvenir” in the best sense — a way to remember. Oh! Glad to hear it! I love the beauty and vulnerability of this post! How wonderful the array of emotions brought on by these glasses. Thanks, Sarah! This is a more vulnerable story in some ways. This post is awesome. Thank you for sharing. Thank you, Larissa! Glad you like it. What an unpleasant woman! It’s always jarring when your expectations turn out to be off base, and someone makes you feel that something special is silly. They are lovely glasses, I’d be glad to find them even without the backstory that they have for you! Thanks, May! Glad you like them too. Thank you for reading, Silvana! And thanks for your thoughts. I appreciate your kind words. Deutschland: “The customer is always wrong…and kind of annoying, too” Great post, Jill. Thank goodness not every shopkeeper acts like her.